You have to take the road from the airport to the city centre, driving on Eleftheriou Venizelou street, which leads you in front of the Municipal Market (a cross building on the map) driving on Chatzimichali Giannari street till Skalidi street. 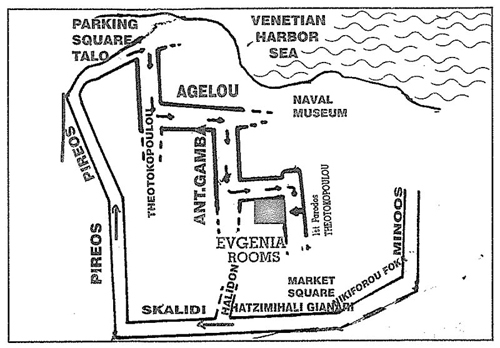 At Skalidi street you have to turn to the right at Pireos street (passing a supermarket named Champion). Drive to the end of that street and you will see the water front turn then again to the right and drive about 50 meters to the public parking place at square Talos, which is free of charge. 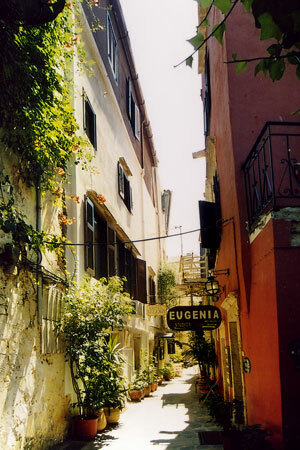 You have to walk the last 80m on Theotokopoulou street, taking the third street/passage on the left (Angelou), then first right, then first left and at the end is Arhontiko Evgenia Studios. Driving west on the national road, take the exit Chania, then turn left to Chania City Center. Driving on that road you (6 km or about 3 miles) will lead you in front of the Municipal Market (a cross-shaped) building on the map. At the traffic lights (on the corner of the pharmacy) turn left; you will be then on Chatzimichali Giannari street. Driving on this street it soon becomes Skalidi street; you have to turn to the right at Pireos street (passing a supermarket named Champion). Driving from Souda Port to Evgenia Studios you must take Souda's Avenue and drive for approximately 12 minutes until you will reach Nearchou street. Driving on that road you will find all the way ahead Tzanakaki street. Continue until you will find yourself in front of the Municipal Market (a cross-shaped building on the map) on your right. Keep on driving all the way down at Skalidi street. At Skalidi street you have to turn to the right at Pireos street (passing a supermarket named Champion). ** As soon as you will reach Talos square of the Old Town call us at (0030) 6972827745 or (0030) 28210 91721 so that we would help you to find us easily.